* The lovely banner was created by Charlotte with the resources I bestowed onto her. Epic Recs is hosted by the lovely Judith (Paper Riot) and Amber (Books of Amber). It is a feature where each month, you and your partner force a book onto each other, or to put it nicely, recommend one to read. My partner in crime will be the one-and-only Charlotte of The Simple Tales. Let the fun (*ahem* pain) begin! Oh boy, well, guys. I have to make an announcement, and that is…I failed March’s Epic Reads. *hides and cries* I never read Stormdancer. I had every intention to read it, but it just didn’t happen. The main reason: I became enamored with my OUTLAW BABES project, so I was spending a lot of my time developing and writing about my characters. 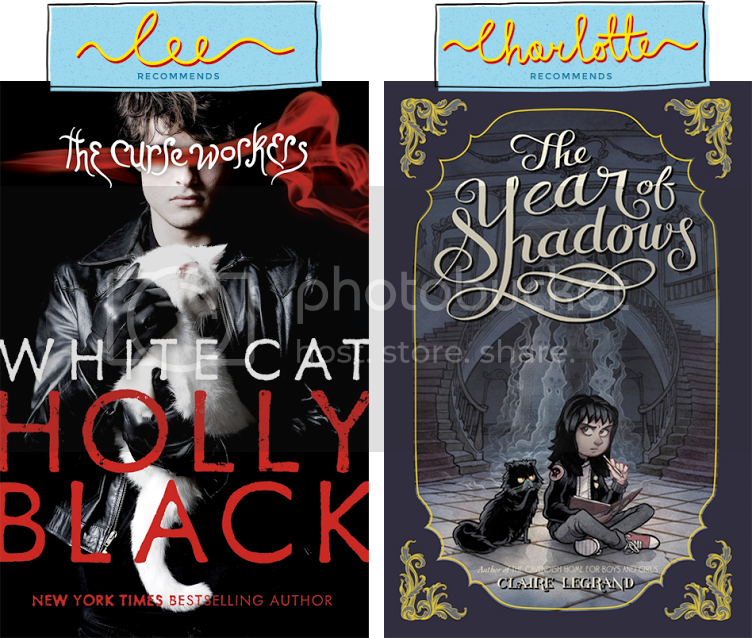 For this month’s Epic Recs, I’m recommending Charlotte White Cat by Holly Black. This is totally a Cee book that people need to be read. It has con artists/grifters, magical powers, male POV, and BROTHERS. ALL MY FAVORITE THINGS. Initially, I hadn’t thought much about the book when I first read it, but when I was talking about it with a friend, I realized that it had so many of my favorite tropes, and the relationship of the brothers, guys, wow. Such an emotional ride. I cannot wait until Charlotte reads it! Charlotte recommended me The Year of Shadows by Claire Legrand. I adore Claire Legrand’s work. I’ve only read The Cavendish Home for Boys and Girls, and when I think back on that book, I just remember it so fondly. What I’m most excited about The Year of Shadows is the Gothic-ness of it! I’m just a fan of that genre because I love that dark and creepy. And apparently, there’s family goodness? Yeeeessss. You can read her Epic Recs post about why she recommended me this book. What do you think about our recommendations? Have you read either book? Tell me all about it! Charlotte and I have just been acing this Epic Recs thing. Given, I didn’t read Life By Committee until the last week of February, but oh boy, I enjoyed it more than I expected even though Tabitha was all sorts of messssy, which I appreciated. I loved when the Life By Committee group appeared because it was a unconventional support group that recommended Tabitha to do things she shouldn’t, but those advice weirdly worked and had a way of working itself out. 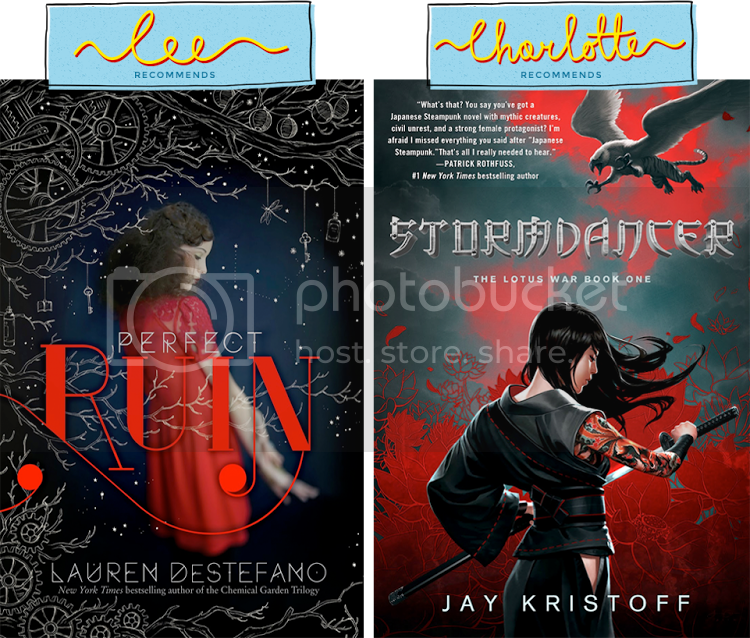 For this month’s Epic Recs, I’m recommending Charlotte Perfect Ruin (The Internment Chronicles #1) by Lauren DeStefano because I want to torture her. I don’t think I’ve made it a secret that I utterly loathe this book. I want Charlotte to read it so she can get a taste of how ridiculous and anger-inducing this book is and so she can understand why I hate it. Essentially, I want to have another buddy in my “let’s talk about how horrible Perfect Ruin is” club. Godspeed, Charlotte. I am here for you. Charlotte recommended me Stormdancer by Jay Kristoff. Eeeeeeek. Reasons why I’m excited: 1. that cover is so gorgeous and badass, 2. there’s a mythological creature, and 3. Asian main character! I love the thought of this mythological creature and Yukiko having to rely on each other to survive even though they might not like each other at all. And can we talk about how Yukiko sound so kickass? I’m just a bit worried that it’ll be a bit hard for me to get into. You can read her Epic Recs post about why she recommended me this book. January’s Epic Recs was a big success! Charlotte loved The Boyfriend List (YEEEEEEEEE! ), and well, me? I finally read Vicious and LOVED IT! Every scene, character, word, absolutely EVERYTHING! Supervillains + found family? C’mon now! It’s just a frickin’ fantastic book, and everybody needs to go read it! 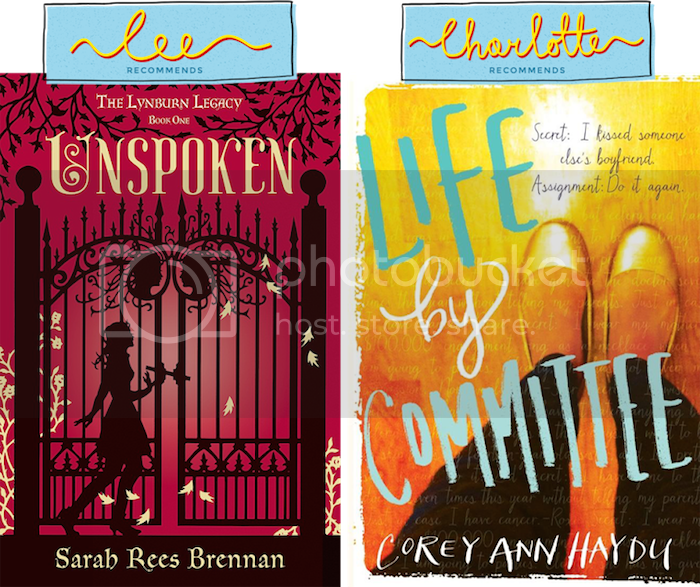 For this month’s Epic Recs, I’m recommending Charlotte Unspoken (The Lynburn Legacy #1) by Sarah Rees Brennan. I LOVE this book. I recently reread it and oh boy, it never fails to get me frickin’ emotional! Just one thought about it sends me on an emotional rollercoaster, and you know if you get that feeling, it’ll be a good ride. I love the gothic atmosphere to this book, all the characters who are amazing especially Kami (who I wish was my best friend), the witty dialogue, the friendships, and the romance. Guys, let me just talk about how in love I am with 1. Kami Glass (she’s such a fabulous and kickass character) and 2. the romance. I’m not a fan of YA romance, but something about the one in Unspoken works for me. I AM IN THAT SHIP FOREVER. SO IN LOVE WITH THEM AND EVERYTHING. Charlotte recommended me Life by Committee by Corey Ann Haydu. Charlotte loves this book, but she hasn’t said too much about why I should read it other than “I loved this. Read it!” I know she’s a bit worried I might not like it since it doesn’t have my favorite tropes, but I’m hoping I do like it! *crosses my fingers* You can read her Epic Recs post about why she recommended me this book. Charlotte and I have decided to take part in Epic Recs! HOORAY! It makes sense for us because I recommend Charlotte A LOT of books, but I don’t think she has (well, maybe she has, but I don’t actually read her recommendations). I guess this is sort of our way to ensure that I actually read the stuff she’s recommending me. For the first Epic Recs, I am recommending The Boyfriend List by E. Lockhart, which I absolutely adored, to Charlotte! What made this book awesome are two things: 1. the way it’s written is creative and fun (there’s footnotes and lists and awesomeness! ), and 2. the main character is hilarious! Her voice is what kept me going because I’m pretty sure I would’ve wanted to DNF if I hated everything she said. When I finished this book, I was completely delighted by everything about it. The Boyfriend List has the perfect balance of lightness and heaviness that I want in contemporary YA that focuses on high school dramas. And Charlotte is gonna read this. Yesssssssss. Charlotte recommended me Vicious by V.E. Schwab. You can read her reasons why she recommended me this book. I’m extremely excited since I’ve been wanting to read this book like forever, but it always seemed like I never had the time. How can I say no to supervillains? THEY ARE EVERYTHING. So January 2015 is the month when I’ll finally get to read it! YESSSSS. What an awesome book to kick off the start of my first Epic Recs! What do you think about our recommendations? Can you believe I still haven’t read Vicious?